Chris Buhalis is a songwriter from Ann Arbor, Michigan who has been walking Woody’s Road since he “finished” school, bought a guitar and hit the road with a Woody Guthrie songbook. Chris has released two acclaimed albums. He’s still singing, writing and recording his songs, and disturbing the comfortable. 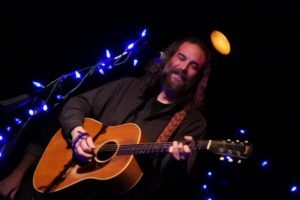 Born in Detroit, singer/songwriter Chris Buhalis opted for the rambling life he sang about in his warm Americana songs. Years of wayfaring, from Alaska to Texas with plenty of points in between, influenced his 1998 debut, “Kenai Dreams,” a roots-folk set with a wandering spirit sung in a dusty Midwestern croon. Buhalis’ heroes loom large in his world, most notably political folk icon Woody Guthrie and Americana legend Townes Van Zandt, the latter of whom made a guest appearance on “Kenai Dreams'” title cut shortly before his death in 1997. Since then, Buhalis has performed an annual tribute concert to both Van Zandt and Hank Williams, Sr. — another acknowledged hero — at a local Ann Arbor bar every year on January 1, which is the anniversary of both singers’ deaths. Over the coming decade, Buhalis remained a prominent figure in Michigan’s folk scene performing frequent solo shows, appearing at festivals, and organizing various charity concerts. By 2013, he’d amassed a group of songs he felt were strong enough to record and entered the studio to begin making his long-awaited follow-up album. Just a few months later, the sessions were derailed when a work accident with a table saw severely injured his left hand, leaving him uncertain about whether or not he’d ever be able to play guitar again. Over the next two-and-a-half years, Buhalis battled his way through several surgeries and countless hours of physical therapy, willing himself back into picking shape and finally completing work on his album. Released in February 2016, Buhalis’ hard-won second LP, Big Car Town, featured longtime collaborator Jeff Plankenhorn along with prominent Michigan musicians like Joshua Davis and Michael Shimmin.